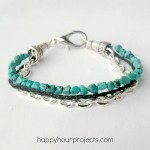 I recently ran across an inspiration board on Pinterest that was all about rusty metal and turquoise patina. I loved the colors together and the way that the patina seemed to dance on the metal. I thought these colors were just gorgeous for fall and since I love all things old and worn, I decided to have a play and Explore Beyond at creating my own rustic metal shapes. I love that I have a sense of control, yet at the same time, each piece was unique in its own way. Have you checked out my Fringe Statement Necklace Tutorial and Fringe Statement Necklace Style 2and you’re looking for something a little more free and whimsical? This tutorial not only teaches you how to make this fringe necklace, but also teaches you some great skills… Learn how to make a mixed media fringe necklace with this new tutorial with step by step instructions with more than 80 full color photos, learn the basics of wire wrapping. So when I spied these adorable Chirpy Birdhouse Pendants on the cover of Handcrafted Jewelry magazine (a special issue from the editors of Beadwork), I immediately sidled up to him, directions in hand. Here are the basic directions for this mixed-media and collage jewelry piece, adapted from designer Heather Alexander’s tutorial. I love making mixed media pieces and blending different elements into one piece of jewelry. I picked up some turquoise nugget beads when I was on vacation last summer – it’s my daughter’s birthstone – and I thought Spring Bling Week would be a great time to get them out and start working with them! First start out simple with these next two tutorials showing different methods to create a basic 5-6 petaled flower for jewelry. These flowers have a very cute look that are sure to please. Be sure to stock up on your basic jewelry findings to complete these pieces. This tutorial is very easy to do it or the flower is very beautiful and can be used to make a nice necklace. Mixed Media Domino Pendant Tutorial: Using Resin as a topcoat. You never lose by beading.